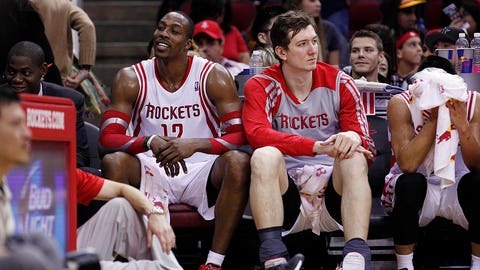 Rockets center Omer Asik (right) has been unhappy with his role as backup to Dwight Howard (left) and Houston could be looking to trade him. Cleveland has been involved in trade talks with Boston and Houston, who are trying to work out a deal involving Rockets center Omer Asik, league sources told FOX Sports Ohio on Wednesday. Asik has been unhappy with his role as Dwight Howard’s backup, and the Rockets are hopeful of moving him by Thursday night. Details on the Cavs’ involvement or other players potentially in the mix are sketchy, as discussions are said to be ongoing. Nothing has come close to being settled as of Wednesday afternoon — and the talks are shifting back and forth between a straight-up two-team trade and a potential three- or four-team deal, said one source. Cavs general manager Chris Grant has the green light from ownership to make a trade, sources said. While the Cavs have played better in recent weeks, winning five of eight and taking Miami and Portland to the wire in losses, owner Dan Gilbert is reportedly not happy with the overall record (9-15) and is expecting more. The Cavs have scored at least 107 points in four straight games, averaging 110.3 in that span. Still, trade rumors have continued to swirl around the team, with center/forward Anderson Varejao and Dion Waiters being mentioned most. But Waiters has denied he wants to leave and has not asked the Cavs for a trade. Brown addressed some of the trade rumors after Thursday’s loss to the Trail Blazers, when he mispronounced Asik’s name.